You know my sister and I have a 'little'....umm...BIG thing for The Mouse. You know him, got a couple castles on the coasts and a few more overseas. Well, I call myself blessed beyond belief because this girl got selected to host a Disney Side at home party. Oh yeah, Mickey picked me. I was given the chance to host a #DisneySide party to show off my Disney Side. Well, why stick to a party when you can spread the love around town (and the country)? My box was a little beaten up on top, but the insides were just fine. Thanks to American Tourister--official luggage of Disney, I have a new carry on bag. With wheels! And they spin 360 degrees!! I got to try out my new rolly spinny bag (yes, that's what I call it) on my trip to DC. Never had an easier time moving between gates since my laptop was in it and not on my back. And I had to truck through Minneapolis to change concourses and go from next to last gate to last gate in the other while grabbing lunch on the way. I had 30 minutes--loads of time. HA! But I could move quick with my rolly spinny bag. Check out my Disney loot! There's cups, plates, napkins, balloons, decoration, tablecloth, cookie cutters, measuring cups, race signs, Mickey/Minnie Love prints, HP (two smiles) Photo Card making set, cupcake papers, run window clings and bracelets, ideas on how to face paint Disney characters, stickers, tattoos, Muppet calendars, recipes, and more!! We used the bulk of our Disney Side items at Nathan's Birthday Party. We put the bracelets, Muppets Calendar, Balloons, Tattoos and Stickers in his treat bags. I was going to use the plates/napkins, etc for the party, but the movie theater provided. So I'm now holding that until a certain someone I know celebrates her 40th this year (not me--my baby sis---don't tell her). She mentioned wanting a Disney Party...woot woot. Big sis is going to deliver! I love the look on his face while we're singing Happy Birthday! Rebekah had some friends over for a playdate on another day and for snacks, we did Mickey Mouse Doughnut platters. Each child and mom got a doughnut. We had a ball...but my camera was being fixed and I forgot to take pics on my phone while the girls played. Since Rebekah has enough princess dresses and costumes for more than a week, every girl got to dress up as a princess. So much fun! AND THEN--if that wasn't enough partying, I couldn't help it. 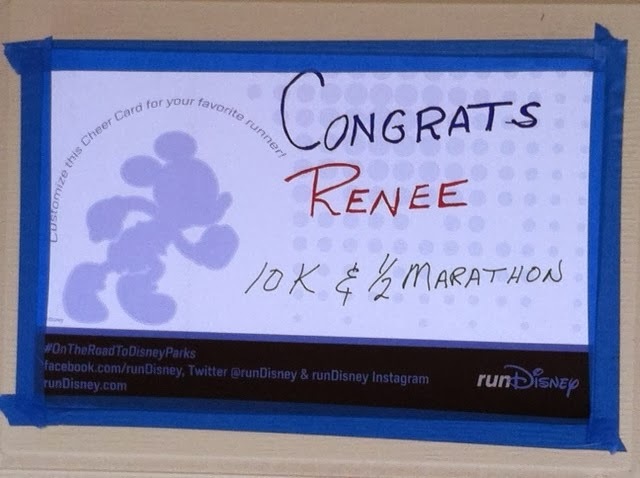 I had to send some of the Run Disney window clings, bracelets and signs to my sister and her friends. I snuck them into a box to my mom who got them in the suitcase for my sister. 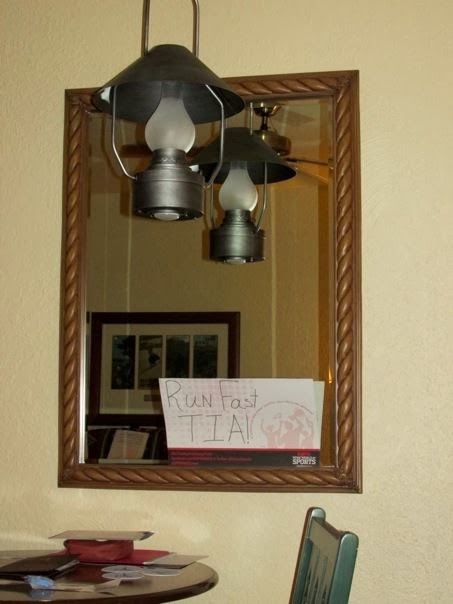 My kids had me make a sign that said, "Run Fast, Tia!" I'm so proud of my sister. She ran the Tinkerbell 1/2 at Disneyland in January. Then a few weekends ago, she did the Glass Slipper Challenge at Disneyworld. It's a 10K on Saturday and a 1/3 Marathon on Sunday. 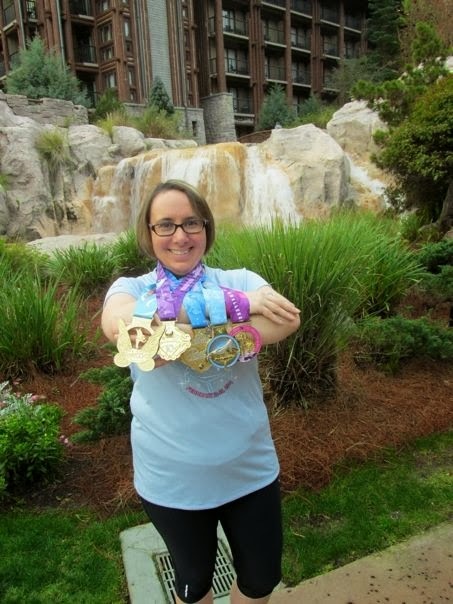 By completing both 1/2 Marathons, she earned her Coast to Coast medal. My sister with FIVE medals. Again--I'm so proud. Here's our sign in her hotel for inspiration. Not to be left out, Dad & Mom put one up on her garage for her arrival home. We have had a long multi-event experience with showing our #DisneySide. Be on the lookout for a #DisneySide giveaway coming soon. Disclosure: I was provided with a Disney Side kit in exchange for hosting a party and posting on my blog. No other compensation was given and all opinions are my own. Feel so honored to be mentioned in your blog! And, I'll act surprised later this year when Mom recreates my 4th (I believe it was) birthday party theme for my 40th! Well, sis, you deserve to be mentioned. Not just for the running, but because when I think of showing my Disney Side, I think of you!